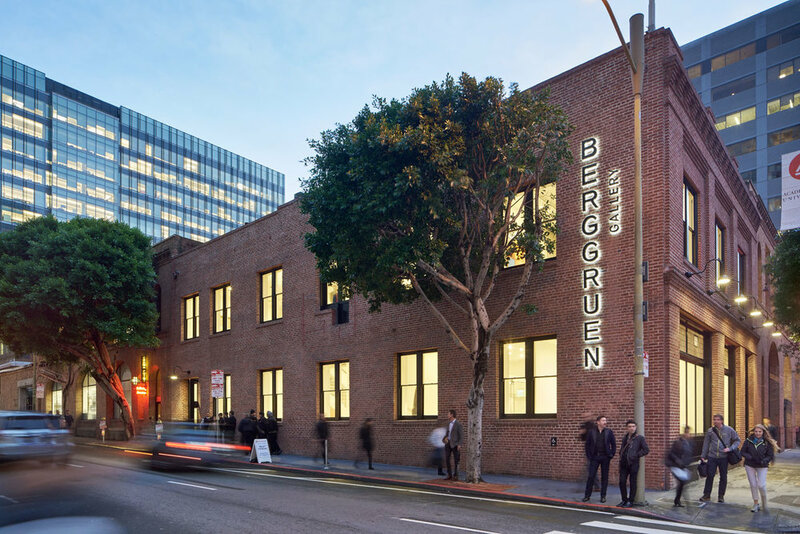 This adaptive re-use project converted a 10,000 square-foot brick historic warehouse building, previously housing a dark nightclub, into a light-filled, museum quality art gallery in the heart of downtown San Francisco. The architecture is intentionally deferential to the artwork, and to the viewing of art. Sight-lines were rigorously studied, affording visitors powerful connections: with the art, the gallery team, other visitors, and even the city beyond. Multiple scales of space created a variety of art viewing experiences. The gallery consists of exhibition space, showrooms, and offices distributed over three stories, as well as a grand central staircase made of wood and glass; the lower-level staircase transitions with triple dimension allowing for overflow seating as part of the digital and artist presentation space. The architecture is stylistically minimal and subtle – intentionally deferential to the art.